These homemade Strawberry Rhubarb yogurt parfaits are not only packed with flavor, but they’re also quick and easy to make. 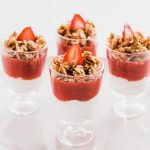 Both the homemade granola and compote can be made ahead which means these fruit and yogurt parfaits can come together in just minutes. Combine oats and almonds in a bowl. Whisk together honey, coconut oil, vanilla, cardamom, ginger, and salt; stir into oats and toss to coat. Transfer oat mixture to a baking sheet and bake until golden brown and toasted, about 20 minutes, stirring twice during baking. Transfer pan to a wire rack and let cool completely. Combine strawberries, rhubarb, water, and honey in saucepan over medium heat. Cook fruit, mashing with a potato masher, until smooth and mixture starts bubbly. Reduce heat to medium-low and cook 20–25 minutes until liquid has reduced to about 1½ cups. Off heat, stir in vanilla. Let cool to room temperature then store in an airtight container in refrigerator until ready to use. Layer yogurt, compote, and granola into a servings bowls. Top with sliced strawberries and serve. Keep granola in an airtight container at room temperature for up to 1 month. Keep compote in an airtight glass container in the refrigerator for up to two weeks, or in the freezer for up to three months.